After “Aashique 2 “ Mohit Suri is counted amongst the top directors of Bollywood today and “Ek Villain” is his first movie outside Vishesh Films. Hence a lot of expectations were built before the release by Balaji’s Marketing strategy and with good music to back it, this could have been a cake walk for Mohit . “Ek Villain” is the Bollywood remake of the Korean movie “I Saw the Devil”, Mohit with Tushar Hiranandani tries his best to put it in a Hindi Film formula. So it tells us the story of Guru (Sidharth Malhotra) who is the henchman of the local goon Ceaser (Remo Fernandes) who kills people for living but life changes for him when he meets Ayesha (Shradha Kapoor) and marries her but the happiness is short lived when a serial killer Rajesh (Riteish Deshmukh) plays havoc with their lives. How Guru copes up with the serial killer makes the rest of the story. Written by Tushar Hiranandani the screenplay is bumpy and the problem is Tushar wanted to mix all genres in one film whether it was Romance or Thriller or Action and too many sub plots and inane characters in the sub plots weakens the main plot. The is no proper justification given as to why Rajesh becomes a serial killer, I felt some more work should have gone in making this character believable, it looks half baked. The biggest plus of the screenplay is, that it is fast. The dialogues by Milap Zaveri at times is good and at times it looks too dramatic for no rhyme and reason. Mohit Suri’s direction emphasizes too much into blood and gore. The confrontation sequences between the two main protagonists Guru and Rajesh looks interesting initially but later becomes repetitive. Mohit tries to put quite a few twists which makes the movie a bit interesting. But Mohit fails to keep the interest of the audience till the end which is important for a thriller. 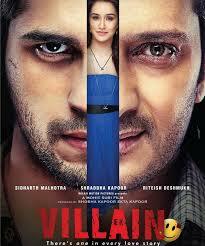 It is the performances by the lead cast which lifts the movie especially the chemistry between Sidharth & Shradha. Sidharth as Guru puts his best till date, it is a good to see Sidharth doing something which is outside his comfort zone. Shradha Kapoor brings the freshness with her portrayal of Ayesha and her presence gives the audience a breather from the blood and gore. Riteish Deshmukh as Rajesh brings enough menace required for the role but it is the writing which puts him down, this could have been a memorable character. Other actors like Remo Fernandes and Shaad Randhawa are wasted. Kamal R Khan (Remember KRK) is irritating and wastes screen time. The music is another highlight of the movie, somehow Mohit just like his uncle Mukesh and Mahesh Bhatt gets the best from his composers. So again Ankit Tiwari, Mithoon and the Pakistani music band SOCH ( Rabi Ahmed & Adnan Dhool )give melodious music, especially “Galiyaan” composed and sung by Ankit Tiwari and “Banjara” composed by Mithoon and sung by Mohd. Irfan are the best. Cinematography by Vishnu Rao is pleasing to the eyes. Editing by Deven Murudeshwar is good.